In this project, BCA applied its use of John Heron’s Cooperative Enquiry method (a cycle of ‘idea, action and review’) to working with people with dementia. A BCA team of professionals and volunteers carried out projects using arts activities and simple listening skills with clients, care staff, school and business volunteers in residential homes and day centres. The BCA Team and community volunteers, including those recruited from business and schools, gained insights and skills, and satisfaction from knowing they helped to make a difference. Elizabeth’s story illustrates the various stages by which a lady with interfarct dementia came to produce a meaningful image and caption which helped her to relate back into her own life, and with her family. Cooperation: Bessie was introduced to the activity in a small group which included an artist volunteer. She was not left to flounder on her own. Experimentation: The medium used in the group was black ink and unusual tools – twigs, sponges, card, string as well as brushes – at first simply to play with the ink to make experimental marks. There was no ‘right’ or ‘wrong’ – marks could not be rubbed out, but a fresh piece of paper could always be provided for more experimentation. Random drawing from life: When accustomed to playing with the tools and the ink, a selection of random natural objects were presented to offer inspiration for further working with the ink. Stones, leaves, familiar vegetables, flowers – but NOT, for instance in a vase with symmetrical sides. It was pointed out that the frustration of failing to get the image ‘right’ could sidetrack the whole experience. 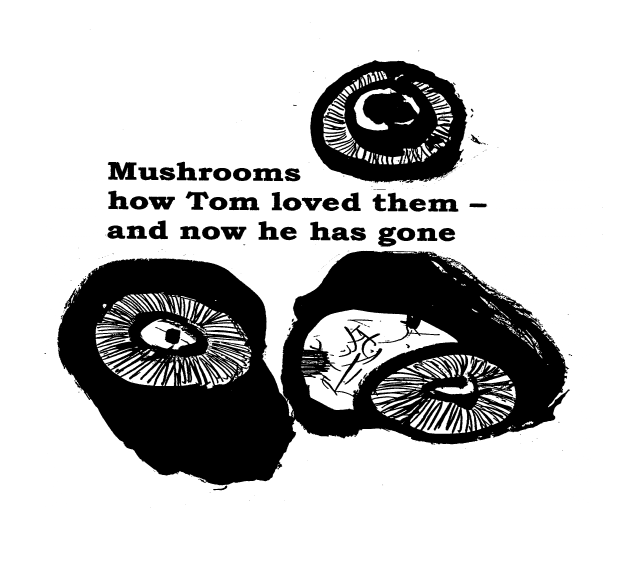 Bessie chose to focus on the mushrooms, and covered her paper with a variety of images relating to these. Selection of images: With the help of the artist volunteer two or three of the images were selected, and isolated for photocopying. They could be enlarged, reduced, placed together in a group, given some significance. Presentation: Together her images and the caption were presented as the cover for a notelet, enlarged as an A4 picture for display in her room, and included in a book of similarly gathered images. An unrelated visitor was so impressed he asked to be allowed to have a copy of this example of art enabling meaning to emerge from the circumscribed life of someone with dementia. Sharing: The day came when her key worker showed the picture to her grandchildren. For the first time they were able to understand that Bessie had realised that her son, their father, Tom, had died – was ‘gone’. Together they were able to share their grief with her for the first time. Comforting one another a strand of reality was woven into their relationship, a degree of meaningful interaction, significant to Bessie, her grandchildren, and illuminating as well for her carers. Her key worker’s comment was ‘This afternoon a lot of healing took place. It is the kind of afternoon that makes my job worthwhile’.